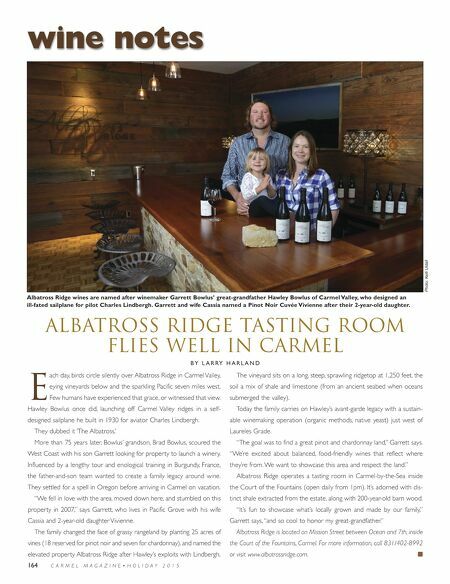 Albatross Ridge Tasting Room Flies Well in Carmel B Y L A R RY H A R L A N D 164 C A R M E L M A G A Z I N E • H O L I D A Y 2 0 1 5 wine notes Albatross Ridge wines are named after winemaker Garrett Bowlus' great-grandfather Hawley Bowlus of Carmel Valley, who designed an ill-fated sailplane for pilot Charles Lindbergh. Garrett and wife Cassia named a Pinot Noir Cuvée Vivienne after their 2-year-old daughter. Photo: Kelli Uldall E ach day, birds circle silently over Albatross Ridge in Carmel Valley, eying vineyards below and the sparkling Pacific seven miles west. Few humans have experienced that grace, or witnessed that view. Hawley Bowlus once did, launching off Carmel Valley ridges in a self- designed sailplane he built in 1930 for aviator Charles Lindbergh. They dubbed it 'The Albatross.' More than 75 years later, Bowlus' grandson, Brad Bowlus, scoured the West Coast with his son Garrett looking for property to launch a winery. Influenced by a lengthy tour and enological training in Burgundy, France, the father-and-son team wanted to create a family legacy around wine. They settled for a spell in Oregon before arriving in Carmel on vacation. "We fell in love with the area, moved down here, and stumbled on this property in 2007," says Garrett, who lives in Pacific Grove with his wife Cassia and 2-year-old daughter Vivienne. The family changed the face of grassy rangeland by planting 25 acres of vines (18 reserved for pinot noir and seven for chardonnay), and named the elevated property Albatross Ridge after Hawley's exploits with Lindbergh. The vineyard sits on a long, steep, sprawling ridgetop at 1,250 feet, the soil a mix of shale and limestone (from an ancient seabed when oceans submerged the valley). Today the family carries on Hawley's avant-garde legacy with a sustain- able winemaking operation (organic methods, native yeast) just west of Laureles Grade. "The goal was to find a great pinot and chardonnay land," Garrett says. "We're excited about balanced, food-friendly wines that reflect where they're from. We want to showcase this area and respect the land." 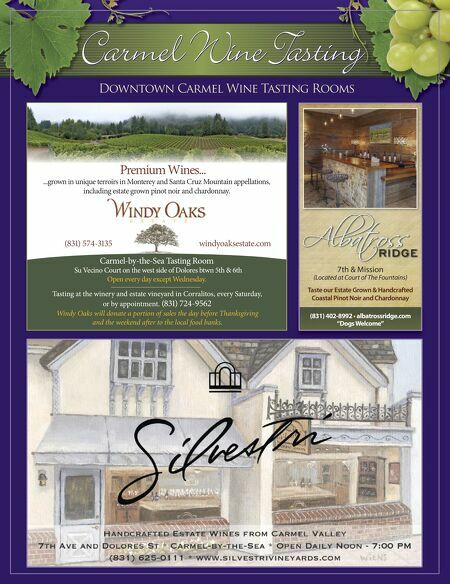 Albatross Ridge operates a tasting room in Carmel-by-the-Sea inside the Court of the Fountains (open daily from 1pm). It's adorned with dis- tinct shale extracted from the estate, along with 200-year-old barn wood. "It's fun to showcase what's locally grown and made by our family," Garrett says, "and so cool to honor my great-grandfather." Albatross Ridge is located on Mission Street between Ocean and 7th, inside the Court of the Fountains, Carmel. For more information, call 831/402-8992 or visit www.albatrossridge.com.